If you have been reading Eco Child’s Play for awhile, you know we hate plastic toys. When it comes to toy storage, our loathing of plastic influences our choices. 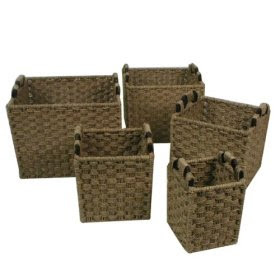 We have found that sea grass baskets are a great alternative to plastic bins for toy storage. Sea Grass Baskets with Wood Handles are more aesthetically pleasing than plastic bins, they are sturdy, and they can be reused for other household items. You can get a Sea Grass Basket in many sizes, shapes, with lids, etc. Sea grass is very important to coastal ecosystems. It grows underwater in extensive beds that harbor hundreds of species. I hope that the sea grass baskets we have purchased were made from sustainably harvested sea grass. This may be something to check on before you purchase your own baskets for toy storage. Seagrass-Watch.org may be of some assistance. Wonderful, thank you. I have some wicker baskets for a lot of our stuff but I’ve also been looking at other possibilities. We’re preparing for a move and the amount of space is changing. This look awesome. And you’re right, it does look so much better than plastic.